Помимо обычных Wal, был создан вариант Do-R Super Wal, выпускавшийся в Фридрихсхафене, первый прототип которого Do R2 взлетел в сентябре 1926 года. Отличавшийся крылом увеличенного размаха и удлиненным корпусом, Super Wal имел две кабины, ДальшеMore>>> вмещавшие 19 пассажиров, и обслуживался экипажем из четырех человек. По конструкции Do R2 был подобен обычному Wal, а его силовая установка состояла из пары двигателем Rolls-Royce Condor мощностью 650 л. с. (485 кВт). Но на Do R4, построенный в 1927 году, установили две пары радиальных двигателей Bristol Jupiter, что позволило увеличить взлетную массу и максимальную скорость машины на 33% и 16% соответственно. Super Wal строился по лицензии в нескольких странах и использовался разными авиакомпаниями, включая, конечно, и "Deutsche Luft Hansa". В 1934 году самолеты семейства Wal получили обозначение Do 15. SEVERAL weeks ago we recorded in FLIGHT the completion at Friedrichshafen of a new Dornier "Super-Wal" intended for passenger-carrying. 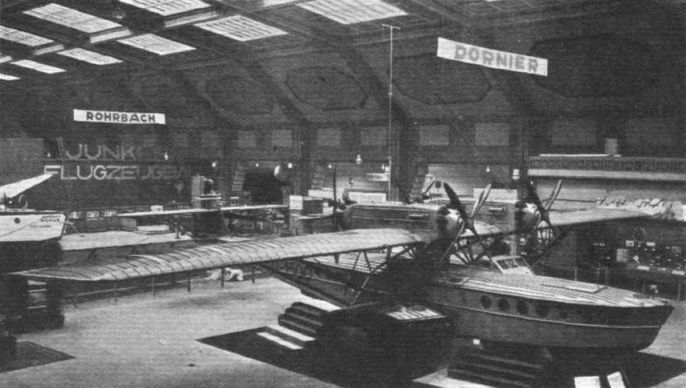 The machine has now passed its preliminary flight tests, and although maintaining a seemly reticence concerning weights and performance, the Dornier Metallbauten Gesellschaft of Friedrichshafen have sent us two photographs of this machine, and a certain amount of information. The new "Super-Wal" is claimed to have attained a top speed of 220 km/hr. (136-5 m.p.h. ), while the photograph of the machine on the water is stated to represent the "Super-Wal" taking off with a total loaded weight of 15 tons (metric, presumably). It is not clear whether the top speed claimed was attained with the full total loaded weight of 15 tons (33,000 lbs.) or at some lower total weight, but assuming the former to be the case, the Everling "High-speed Figure" is 14-2, which does not appear unduly high for a "Wing Power" of 13-4 h.p/sq.m. (1-25 h.p./sq. ft.). On the other hand, if we examine the Everling "Distance Figure" (which is, of course, the propeller efficiency multiplied by L/D at top speed), this is found to be 6-4, which is an unusually high value. Thus if it is assumed that the propeller efficiency, with the geared engines used, is 0-75, the L/D corresponding to top speed is 8-53. It would appear somewhat doubtful whether this is likely to be attained. Even if we increase the propeller efficiency to 0-80, the L/D is still as high as 8. The machine is probably very "clean" in the aerodynamic sense, what with the small amount of wing bracing and the engines placed in tandem, but even so, the "Distance Figure" is so high as to make one a little suspicious. If the above value of the "Distance Figure" is indeed correct, the "Super-Wal" would seem to be an excellent machine for long-distance flights, provided the structure weight is not unduly high. Constructionally the new "Super-Wal" is of normal Dornier type, with a boat hull of Duralumin and a monoplane wing with steel spars and Duralumin ribs and covering. Lateral stability on the water is obtained as in previous Dornier boats by wing stumps growing out of the hull. The boat hull is divided into a series of compartments, in the following order, starting from the bows: space for navigating gear; cabin for 12 passengers; pilots' cockpit on the port side (dual controls), wireless compartment on starboard side; fuel and luggage space; and finally aft cabin with room for 8 passengers. The fuel compartment contains 8 petrol tanks, 4 of 300 litres (66 gallons) each, and 4 of 600 litres (132 gallons) each, giving a total petrol capacity of 3,600 litres (792 gallons). With the petrol in the hull and the engines on top of the wing, pressure feed must necessarily be employed, a system not now in favour in this country, and with four engines to feed from eight different tanks, it may be assumed that the petrol system is far from being simple. The photographs show quite clearly the arrangement of the four 480 h.p. Gnome-Rhone "Jupiter" engines, which are placed in two tandem pairs some distance out on the wing. The engines are fitted with the Farman type of reduction gear, so that the wooden propellers are running at one-half engine speed. The efficiency should, therefore be good, especially for taking off, but no data are available concerning the length of run required. Height 5-9 m. (19 ft. 4 in.). Wing span 28-6 m. (93 ft. 9 in.). 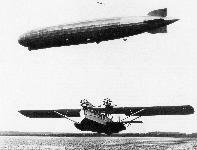 The "Super Wal" is a four-engined monoplane flying-boat, with the engines arranged in tandem pairs on top of the wing. Metal construction is employed throughout, even to the wing covering. In the machine exhibited the engines are Gnome-Rhone "Jupiters," but the type has also been produced and flown with great success fitted with four Napier "Lions." The boat hull is of the flat-sided type, and shows a perfectly straight sheer line. There is a slight Vee bottom ahead of the step, but far less pronounced than that found on all modern British flying-boats. Aft of the step, which is located farther aft than is the main step in British flying-boats, the main hull bottom slopes up to the sternpost, and built on to it is a form of rear step which is not, however, of the same but of far smaller beam than the main hull at this point. This second step, or keel, terminates at the rear in a vertical knife edge, to which is hinged a water rudder. Lateral stability is obtained by wing stumps growing out of the sides of the hull. Exactly how porpoising is avoided with such an arrangement of steps is not clear, but films of the machine taking off indicate no tendency to porpoise, so that presumably this vice can be successfully cured by other means than those generally employed in England. It is to be supposed that the aft step or keel structure serves to reduce the shock on alighting, as the relatively flat vee of the main hull bottom would not appear to English eyes capable of doing so in anything of a rough sea. The Dornier firm has had carried out a very large number of tank tests on models, and it is not likely that the present form has been chosen in any haphazard manner. The boat deck is but slightly cambered, so that it is possible, when the machine is on the water, to walk about "on deck" in comfort. The shape of the whole hull is more like that of a modern high-speed motor boat, and has many advantages for handling on the water. How the drag coefficient compares with that of representative British flying-boat hulls we have no means of knowing, but in view of the much more nearly stream-line form of our boats, even to the fairing-in of the steps, it seems likely that the Dornier type of hull must have a greater drag coefficient than ours. Whether the wing stump type of side float is better or worse than the separate wing float is open to discussion. Set as the wing stumps are in the Dornier machines at a large angle of incidence (necessitated by considerations of water performance), one would expect them to carry a considerable amount of weight, and while they may, as is sometimes claimed for them (although we have not seen the claim made by Herr Dornier himself), "carry their own weight" in flight, the induced drag must be fairly great in view of the short span. The streamline wing float, on the other hand, does not give any lift in return for its drag, but we imagine that the drag itself is probably smaller, partly because of the shape, and partly on account of the smaller volume which a farther outboard position makes possible. As regards the internal equipment of the "Super Wal," this is very comfortable for the 19 passengers, the portholes being large and giving a reasonably well-lighted cabin. The actual cabin space is divided into two separate saloons by a smaller compartment, seating accommodation being provided for 11 passengers in the forward saloon and for eight in the aft saloon. The "Super Wal" is very fully provided with navigation and wireless equipment, and the hull contains, in addition to the two saloons, goods and luggage compartments, as well as a wireless and navigator's cabin. The pilots' cockpit is ahead of the wing, and has a "coach roof" over it for the protection of the occupants. The normal quantity of petrol carried is 3,800 litres (836 gallons), and the oil 300"litres (66 gallons). The main dimensions and weights of the "Super Wal” are as follows :- Length overall, 24-6 m. (80-6 ft.); wing span, 28-6 m. (93-8 ft.); wing area, 143-8 sq. m. (1,547 sq. ft.) Weight empty, 7,800 kg. (17,150 lb. ); normal loaded weight, 12,600 kg. (27,700 lb. ); wing loading, 17-9 lb./sq. ft; power loading (on 2,000 h.p. ), 13-88 lb./h.p. ; maximum speed, 220 km. h. (136-5 m.p.h. ); cruising speed, 180 km./h. (112 m.p.h.). A 1,300-H.P. 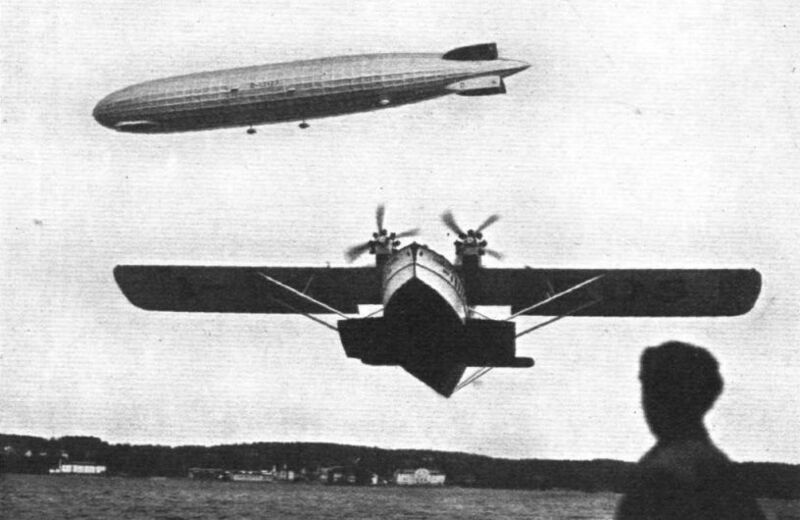 FLYING BOAT: This photograph shows the new Dornier "Super-Wal," fitted with two Rolls-Royce "Condor" engines, in flight over Lake Constance, where it recently underwent its first flying tests. This machine has seating accommodation for 21 passengers in two separate cabins. An idea of the size of the machine may be formed when it is pointed out that the wing span is 28-5 m. (93 ft. 6 in.) and the wing area 143 sq. m. (1,540 sq. ft.). THE DORNIER SUPER-WAL: This Dornier all-metal flying-boat, which is fitted with two Rolls-Royce "Condor" engines of 650 h.p. each, recently carried out some remarkable flights over Lake Constance, on one occasion carrying 55 passengers at 125 m.p.h. Our picture shows the machine in flight over Lake Constance. 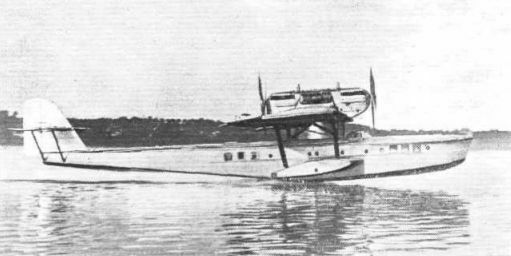 A NEW DORNIER SUPER-WAL: Our picture shows a new all-metal Super-Wal flying-boat, fitted with four British Napier "Lion" engines, which recently carried out successful flying tests over Lake Constance. In addition to 20 passengers, this machine carries a crew of three, and with a full load of 12 tons it has a top speed of 125 m.p.h. ; it has a cruising speed of over 105 m.p.h. Dornier Super Wal - увеличенный вариант Wal с более мощной силовой установкой и повышенной грузоподъемностью - заходит на посадку на фоне пролетающего дирижабля Zeppelin. "GRAF ZEPPELIN": The new Zeppelin airship L.Z.127, which has just accomplished a record flight from Germany to Lakehurst, N.J., flying over Lake Constance during her trials. In the foreground is a Dornier "Super-Wal" (four Bristol "Jupiters") flying boat. Do R4 Super Wal отличался от предшественников возросшей скоростью и грузоподъемностью. За время производства этих самолетов сменили четыре типа крыла, постоянно увеличивающихся в размахе, а максимальная взлетная масса машины выросла с 4000 до 10 000 кг. The Dornier "Super-Wal": The power plant consists of four "Jupiters." 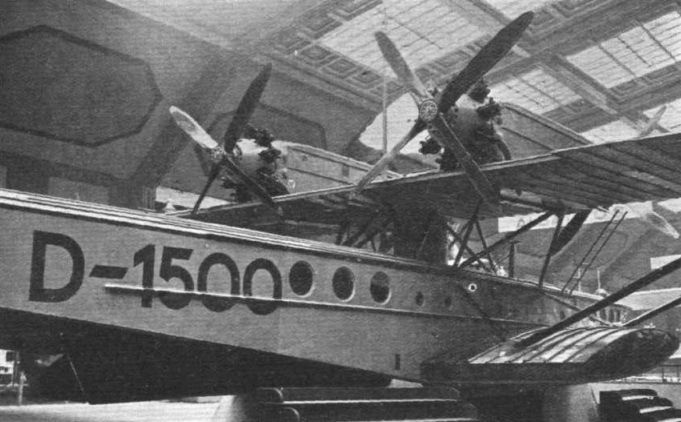 The Dornier Super-Wal "Blauwal": This photograph shows the cowling of the aft engines, the shape of the wing-stump floats, and the narrow-beam aft step with water rudder. 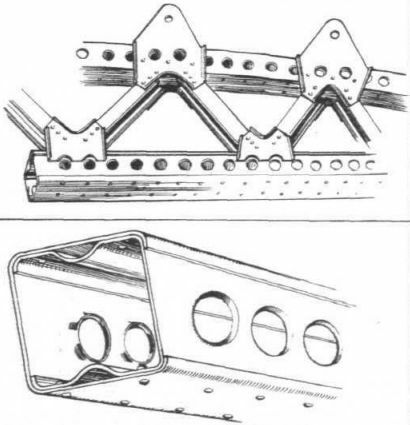 THE DORNIER "SUPER WAL": Sketches showing forms of Dornier metal wing-spar construction. 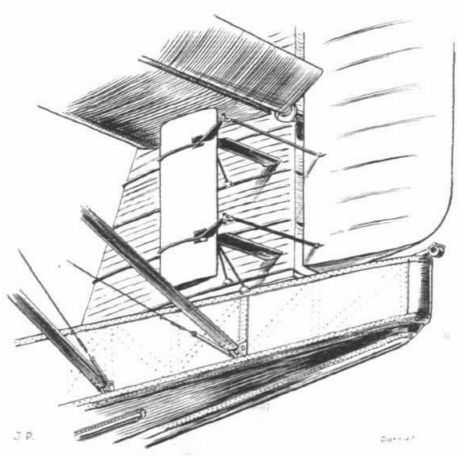 AN UNUSUAL FORM OF RUDDER BALANCE: On the Dornier "Super-Wal" separate surfaces, unstably hinged, are made to facilitate the work of operating the rudder.